My name is George Andrews and I was born in London on 21 July 1950. I started boxing when I was 10 yrs old at a gym in South London, called 'The Fitzroy Lodge Boxing Club', (better known as the 'flower lovers') and my trainers, Mr Vick Andretti and Mr Dave Chandler were both excellent. My training would start with riding my bike to the club and back (about 3 miles) to help make my legs strong and then training commenced for about 2 hours, with skipping and bag work with lots of combinations. During my school days I had 3 amateur fights as a schoolboy and I am proud to have fought at the once famous 'Manor Place Baths' in South London. At the age of 15, I left school and took a job delivering newspapers in the West End of London. At that time, I had a 'Butcher's' bike that had a big canvas bag on the front so I could carry many papers (this was good training for me). I used to ride from home to the West End and back, which was a journey of about 20 miles per day, 6 days a week for the next 2 years. I then got a job in 'Smithfield Meat Market' in the City of London, initially in the 'poultry' section, (because I was too young to work in the meat section) then when I was 18, I moved up to the meat section and it was here that my training really started. I worked in the pig shop as a 'humper (meat carrier)' we carried up to 300 pigs a day. For each pig we had to first weight them, hang them back on their hooks, cut them up into sections, weigh them again, then stack them. I would say that we lifted about 120 tons in a 12-hour shift! I also used to test how strong I was by trying to break the pigs' ribs and succeeded! Some mornings, I missed the only 4.30.am bus, which meant walking or running 7 miles to work! At this time I felt very strong and fit and I continued this type of training for 5yrs. In 1964 I tried to join a Karate club but was refused because I was too young, so I studied out of a book and it wasn't until September 1967, when I started to train in a mixed style of karate-do, in South London. My first tournaments were in All-Styles competitions, the first in Chelmsford in 1968, the next somewhere up in the North of England in 1969. I gained my 2nd Dan black belt in August 1972 and enjoyed training in this style, but I was still looking for something with deep roots. In 1971, I was really impressed by an article in a magazine about Wanatabe Sensei, who had just won the World Championships, together with a feature about Sensei Ei'ichi Miyazato. I wanted to contact someone about Okinawan Goju-Ryu and considered travelling to Okinawa at that time. I even wrote a letter to Miyazato Sensei at the Police Academy, asking for him to teach me when I arrived, hoping one day that I would have enough money to go; but it never happened. So I continued teaching at my dojo at 'The Friends of the Western Buddhists Order', which was based in Archway, North London and 'Crossed Swords Church', South London. I also I taught in Whitney, Oxford and had about 100 Students, training 3 days a week. Okinawan Goju-Ryu Karate-Do at last! It was about March 1973, when it seemed like the Lord had answered my prayers. Two of my friends with whom I had been training with for years, telephoned me to advise me that there was a 5th Dan Okinawan Goju-Ryu Karate-Do Instructor from South Africa now living and teaching in Oxford. This was great news, so while teaching in Oxford I went and paid him a visit and it was to this person that I'm grateful for introducing me to Okinawan Goju-Ryu Karate-Do. Sensei James Rousseau was a big and powerful man, but also kind and gentle. He helped me very much and would invite me to his house over many weekends for one to one training, so that I could undertake the transition and have a better understanding about Okinawan Goju-Ryu Karate-Do. 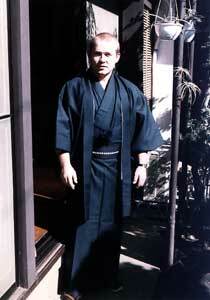 He was ultimately responsible for spreading Okinawan Goju-Ryu Karate-Do all over Europe and made it what it is today. 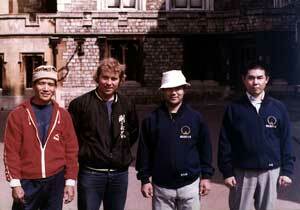 Sensei James also introduced me to Sensei Teruo Chinen, who was 6th Dan Okinawan Goju-Ryu. When I met him, I noticed his knuckles were calloused, but when I shook his hand I felt a warm and friendly person. This was to be, my second step in Okinawan Goju-Ryu. Every time Sensei James invited Sensei Chinen to England, I would follow them around the country to wherever they taught. I really enjoyed the training because I have not experienced any academic education, I thought I could express my education through physical movement and watching Sensei Chinen practising Kata, was like nothing I'd ever seen before. He was only a small man but moved with lighting power, finesse, suppleness, and co-ordination. The Kata he performed was called 'Suparinpei' and after he finished my eyes filled with tears, I was overcome with emotion. 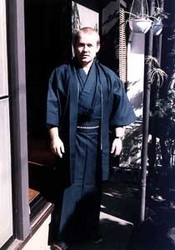 The turning point of my life cam about in May 1977, when Sensei James invited who is to me the Deity of Okinawan Goju-Ryu Karate-Do, Sensei Morio Higaonna to London. I was very excited to meet him and my first meeting was when he was sitting having lunch in a bar and recall my observations were that he was a short, but very broad man with hands that did not look normal! Sensei James Rousseau introduced me; 'this is one of my students, George Andrews', Sensei Higaonna looked up and stretched out his hand and I felt all the hairs on the back of my neck stand up. I clasped my hands over his hand and bowed, it felt like I was holding something made of Marble; I have never in all my life seen anyone such as him. What followed would be a lifetime of hard training understanding of different cultures, communication, adventure and friendship.